We strongly believe that risk and reliability analysis should be used as an integral part of the design process or asset management to support the development of solutions to improve reliability and functionality. There is a vast range of risk and reliability tools and techniques that can be applied to support the engineering design process and operations decision making. However each of the tools has strengths and weaknesses in different engineering scenarios. We use our experience and expert knowledge of the tools and techniques to identify which tool is best for each individual problem. Reliability Value Analysis (RVA) - to understand cost and consequences of failure and identify the value of improvement opportunities. 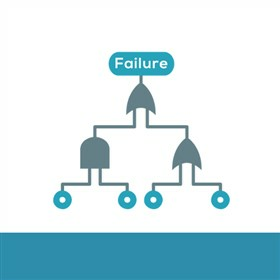 Failure Modes, Effects (and Criticality) Analysis (FMEA/FMECA) - to identify system, design or process failure modes for assessing and managing the risk. Root Cause Failure Analysis (RCFA) - to resolve problems affecting reliability by assessing facts relating to a failure or event at root cause. Fault Tree Analysis (FTA) - to identify the technical cause of specific unwanted events and predict reliability performance. Structural Reliability Analysis (SRA) - to predict design reliability when physical prototypes and qualification tests are impossible. Reliability, Availability and Maintainability Analysis (RAM) - to quantify a system’s ability to remain in an operational state. Technical Risk Assessment and Categorisation (TRC) - to assess what is new or changed from previous projects, that introduces uncertainty or risk to reliability. Reliability Centred Maintenance (RCM) - to optimise maintenance based on potential failure mode criticality, supported by data to mitigate risk.